All my baking and cooking sure i will bring for them to try.They'll love this Honey Castella.They say the cake is soft and slightly chewy.The honey so fragrant.If you love to have soft texture cake,sure you will love this cake. I will make again.I am not satisfied with this cake because it look not very nice.Maybe this weekend or next week or maybe have to wait until i free.This weekend i promise my colleagues will make mille crepe.She request long time already.Making crepe need a lot of time.Then next week got 2 new baby will come to my house.More busy.......Little Keith now very naught...He follow what ever we do. Line a loaf pan with aluminum foil followed by baking paper.Preheat oven at 160'c. Beat eggs white at high speed until slightly form.Add sugar 2 to 3 increments until firm peaks form. Add egg yolk one by one at medium speed until well combined. Add sifted flour and beat until just combined. Pour in honey mixture and beat until combined. Bake in preheated oven for 45 minutes or until top is evenly browned. 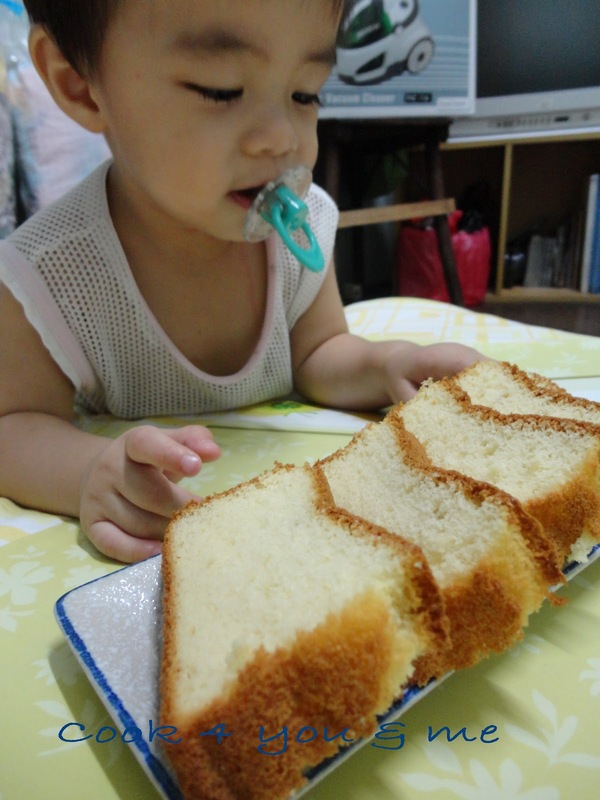 Take out the cake from the oven.Let rest for awhile. 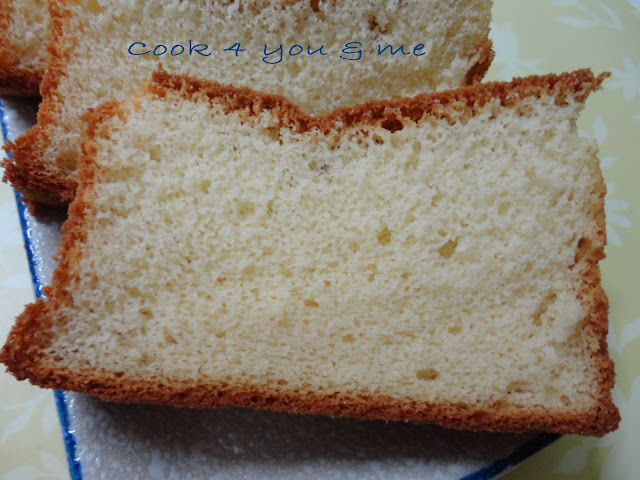 Cover with a parchment paper on the top then invert mould.Remove the loaf pan. Let the cake cool down slightly and wrap it with parchment paper and cling wrap. Store the warm cake inside the fridge overnight.This to ensure the cake has moist texture. 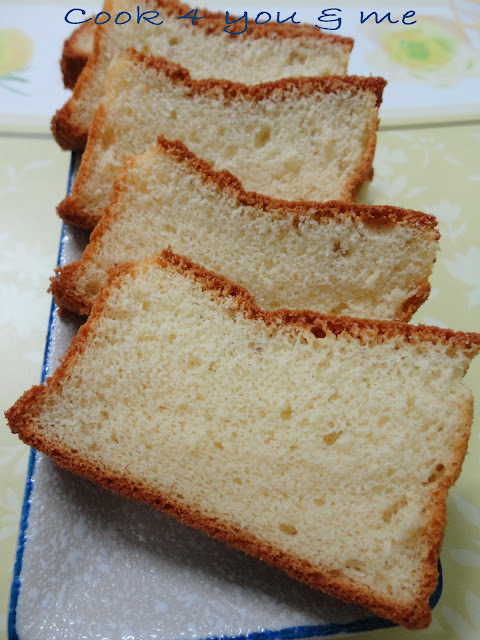 Trim the sides of the cake and serve. 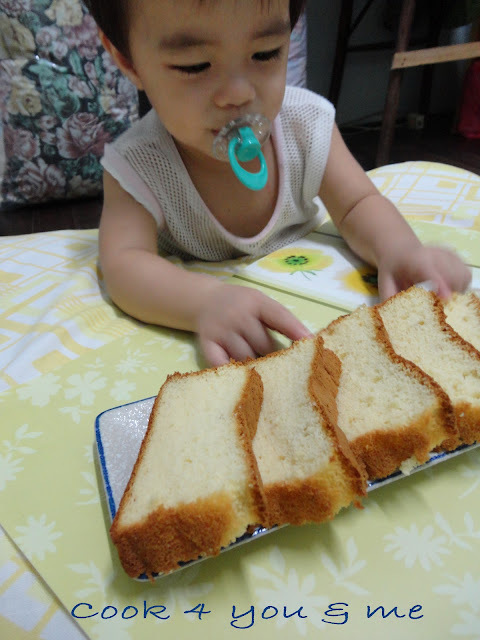 Little Keith can't wait to taste the cake.He look at the cake and keep saying 'mum mum'.Hahaha!!!! eh, u can trim off the sides and eat ma.. I never throw what I trim, they get eaten by my girls, hahahah!